Somewhere in your network, you might be hearing the Obesity Action Coalition talk about taking #OACAction. Or, you might be hearing about #OACAction from a friend, healthcare provider, or even through social media. It’s popping up in online news feeds, OAC educational materials, and even as a section on the OAC website. That’s because this week (Aug 27-31) is OAC’s Anytime Actions Week. But what exactly does #OACAction mean and why is it important? #OACAction changes lives. That’s precisely why ConscienHealth chooses to be an OAC Chairman’s Council member. When we talk about taking #OACAction, the concept is really simple. OAC is calling on its membership community, as well as all of its supporters and followers, to simply take action and do something positive that moves OAC’s work as a nonprofit organization forward in our mission. Action doesn’t have to be a sweeping gesture that puts you on the news or gets your name across online. Simply put, it’s any sort of gesture that helps us spread awareness about obesity, educate and support people who are affected by it and improve their lives in some way, shape, or form. All actions matter and all actions make a difference! 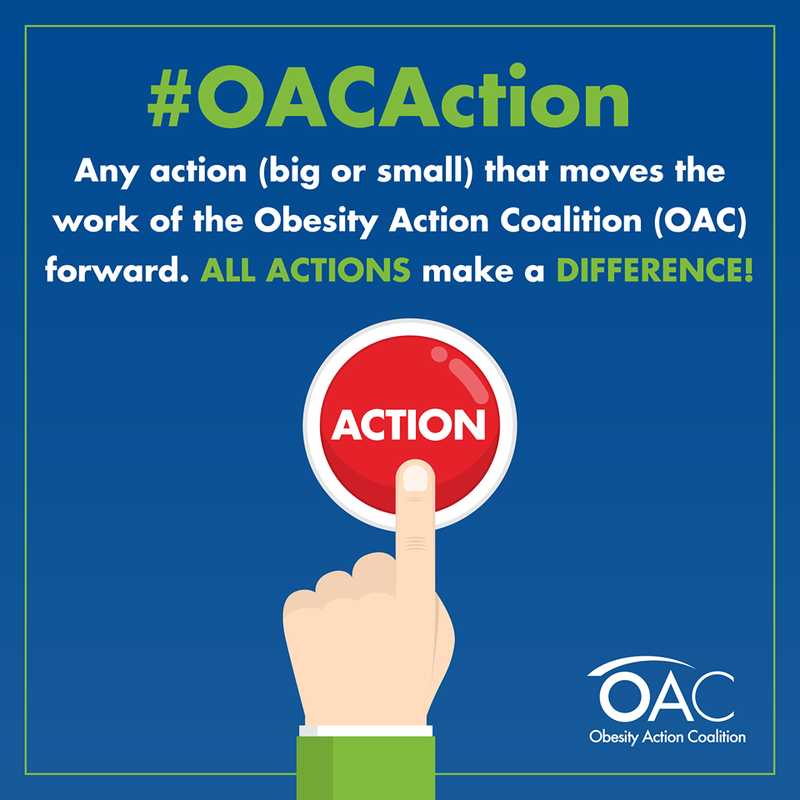 #OACAction can be as simple as sharing OAC’s resources in your own community! Taking #OACAction is meant to be easy, engaging, fulfilling, and fun! Take action on issues that truly matter to you and spark your interest. There will be those who feel compelled to visit Washington, DC, and advocate for important obesity legislation such as the Treat and Reduce Obesity Act (TROA). There will also be those who want to speak to their state legislators and share their personal stories in a public way to influence access to obesity care and treatment. But for those who aren’t ready to take action in a public way, you should know that any effort you make is important. For instance, maybe you start by following OAC on social media and sharing our posts. You can also take OAC materials (from our quarterly magazine to our brochures, guides, and more) to your healthcare provider’s office, local coffee shop, library, gym, and other places in your community. 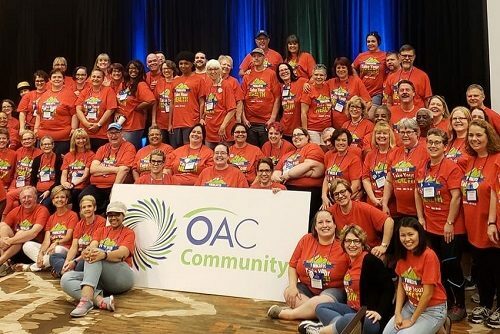 You can also attend OAC’s Annual Your Weight Matters National Convention or simply encourage people you know to call out weight bias and stigma when they see it take place. The options are endless, and there’s always something for you to do! You might think that in order to drive change, actions must be sweeping. That’s not the case! There is so much you can do on a smaller, more scalable level. Outreach actions are a great example – and good news! Limitless possibilities for using outreach actions can help OAC create a better world for people with obesity. When it comes to taking #OACAction, outreach actions are one of many ways you can make a difference. These are efforts you can take in your very own community to help raise awareness of OAC, its mission, and the necessary work we still must do for people with obesity. ☑ Drop OAC educational materials – like Your Weight Matters Magazine – in your hair salon, healthcare provider’s office, library, coffee shop, or gym. ☑ Share OAC materials and information in your local religious or support group. ☑ Offer to host an OAC booth at your community/local health fair. For more on #OACAction, follow the OAC blog here.